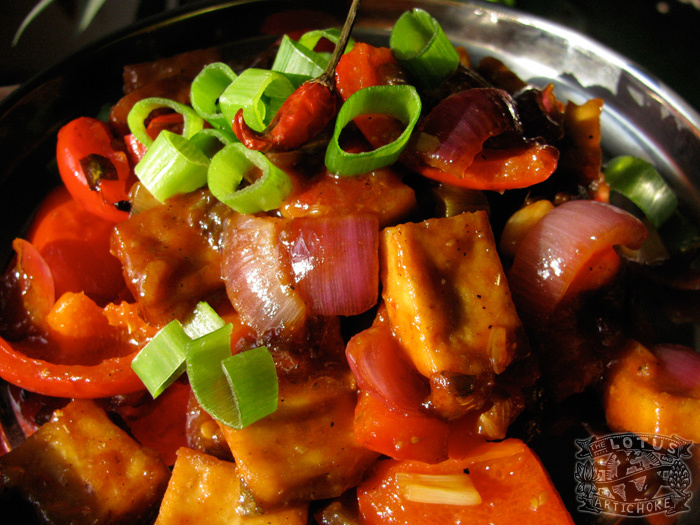 Chilli Paneer (also known by other creative spellings such as Chili Paneer and Chilly Paneer) is one of the most famous Indo-Chinese dishes in India, along with Veg Manchurian. From street carts, restaurants, and home kitchens across the continent you can find this spicy hybrid dish. This vegan Chilli Tofu Paneer variation is easily made by substituting tofu for paneer cheese. Batter-frying with cubes before adding to the sauce and veg is a trick which adds more texture and taste to your ‘paneer’. Tofu isn’t quite as easy to find in India as fresh paneer, but while living in Amravati, India, I was able to find tofu. I experimented often in the kitchen making this stellar Indo-Chinese appetizer. Even the neighbors were impressed! Many Indian restaurants make Chilli Paneer with so much spice, garlic and ginger that the alarm bells start ringing and an order of lassi or raita is the only thing that can cool down the exploding heat. This recipe is not so absurdly spicy, but feel free to add more spices… if that’s your thing. Press the block of tofu (about 1/2 of package) wrapped in dish cloth with plate or book on top to remove excess water. After 20 min, unwrap, cut into medium cubes. Combine lemon juice, soy sauce, nutritional yeast, corn starch in bowl. Add tofu cubes, mix well, coat all pieces. Heat oil in a sauce pan on medium high. Fry battered cubes evenly until golden brown, about 5 min. Remove, drain, set aside. Heat 2 Tbs oil in a medium sauce pan on medium high. Add mustard seeds. After they start to pop (about 30 sec) add onion, garlic, ginger, chili, coriander, turmeric. Stir, fry 3 min. Add tomato, red pepper, green pepper, lemon juice, sugar. Reduce heat to medium, stir, cook for 5 min. In small bowl combine water, corn starch, soy sauce. Stirring, add liquid slowly to tomato and peppers. Add salt to taste, if desired. Add fried tofu cubes. Cook, stirring regularly, until sauce thickens, onions and peppers start to brown, about 5-7 min. Chilli Tofu Paneer without garlic and onions (Vedic style): replace garlic and onions with 1/4 tsp asafoetida, add 1 small tomato. Tropical sweet-sour spin: add 1/2 cup chopped fresh pineapple. More spicy bite and Indian flavor: add 1/2 tsp black pepper, 4-6 curry leaves, 1/2 tsp ground cumin, 1/2 tsp ground paprika along with other spices before frying vegetables. This entry was posted in Indian, Indo-Chinese and tagged chilli paneer, chilli tofu, Indo-Chinese, recipe, spicy, vegan. Bookmark the permalink. My all time favorite! It’s just sooo good – especially with some extra chili heat. To die for! This dish is amazing, the sweet and spicy flavors compliment each other so well! I am definitely going to add pineapple next time. Thanks, Karen. I’m very pleased to hear you’re enjoying the recipes so much! Made this tonight, it was great! Really easy too. Loved the tofu treatment. I used 2 thai chili’s and got what I would consider a “medium” heat. Might try 4 next time. Good stuff! Oh, and a “print recipe” feature would be a huge help. Like to add “keepers” to my stash, but don’t want to print 4 pages worth of HTML. And the layout doesn’t lend well to cut and paste into a text editor. I only mention it because I plan on trying more of your recipes :). I made this tonight and it was really tasty. So far everything I’ve made from your recipes has been great! Hi Julianne, Yay! Thanks for the kind words. I’m glad you’re enjoying the recipes. Made this and it was stellar! Would definitely make again.